Greetings to all seaweed friends! I am a new voice coming to you from the coast of Maine. 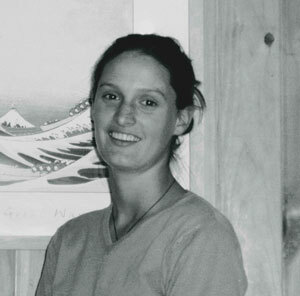 My name is Gwenn, and Larch has welcomed me to work as an apprentice here at Maine Seaweed Company.I have been invited to write this year’s flier, to send warm greetings to all my new friends within the Circle of Friends, and to offer a new perspective on the story that is continually unfolding here. In order to accomplish this task, I first looked back to the many newsletters that Larch has written over the past 30 years that Maine Seaweed Company has been in existence. The strong relationship between evolving earth and sea and evolving man is apparent. The intention of this home has broadened to incorporate children, apprentices, and a venue where people can grow. I feel thankful to have discovered this place at this time in my life. I arrived in Maine as the seaweed harvest was gathering momentum. A wonderful group of fellow workers were here to greet me. During the harvest season, we lived together, ate together, worked long days together, and played together. It was intense and we accomplished so much, both in terms of gathering seaweed that will help others live more healthy lives, and in terms of personal life learning. In April, the harvest season commences with pulling kelp into the boats on frosty-feeling mornings. Time begins to be ruled by the tides. May and early June found us floating in tide pools, gathering digitata. Later in June, we were doing the physically demanding work of wrestling alaria from wave-tossed rocks. In July and August, we were in the rowboats and scampering around island nooks collecting dulse and nori from the rocks. Now it is September. The harvest season is over, the seaweed is dried, and the storage shed is full to the brim. It is all waiting patiently to be packed and shipped off to customers interested in improving their personal health. I am extremely thankful to be here. . . thankful to all of you who support this business, and thankful for Larch for all he is teaching me. I am thankful for this place. Beautiful doesn’t do it justice. I know now that wherever I go from here, I will continue to live near and work with the water. That realization itself is a gift from this place. If any of you ever find yourselves in Maine, come visit! This past summer, I often counted ten or twelve people at table. Gwenn was one of them. She connects with me in the heart space just like one of my own daughters. Now it is fall, and the house is quiet. I’m happy to report that there is a good retreat space here for an individual retreat. If you’re interested in discovering this place, please get in touch with me. You could come here today and find a large sunny bedroom with a woodstove waiting for you, with plenty of space for yoga, and a good Bose sound system for relaxation, movement and bodywork. There is a fine white cedar hot tub outdoors (unchlorinated!) for softening up before you receive bodywork. You can walk a forest path along the granite shoreline (we’re located 30 miles east of Bar Harbor and Acadia National Park), you can paddle a kayak, or we can go out together in a boat or a canoe. You are welcome at table as I cook for my 14 year old son, Jay, and other folks who drop by from time to time. Last week, my 21 year old daughter Sarah was here for a two months visit. Sarah is a massage therapist, she has worked at Esalen Institute, Big Sur, California, and she is coming back to New England for the winter. Do we agree upon a definition of enough in the material sense, and do we agree about how we will give back to the world, once we have enough? Are we transcending gender differences and bringing our relationships into the realm of the heart? Are we encouraging and supporting each other in developing a spiritual practice? Are we deepening our potential for contemplation and profound presence? If this interests you, please get in touch with me. Winter is coming. The seeds that we plant now in our consciousness will come to fruition next spring. I look forward to some long winter talks with people. I have unlimited calling, so phone access to me is easy. Please drop me a note first. After all, I started this conversation with a thoughtful note to you. Rest in the Light, abide in the Heart.